New women’s teammates capture their first title as a unit, while the top-ranked men’s team goes down in the finals. Two teams were crowned champions on a sunny Sunday at Lake Sammamish Park. One team won it all for the first time as a unit. The other team avenged a tough loss, beating a team that can be counted among the best in the world. 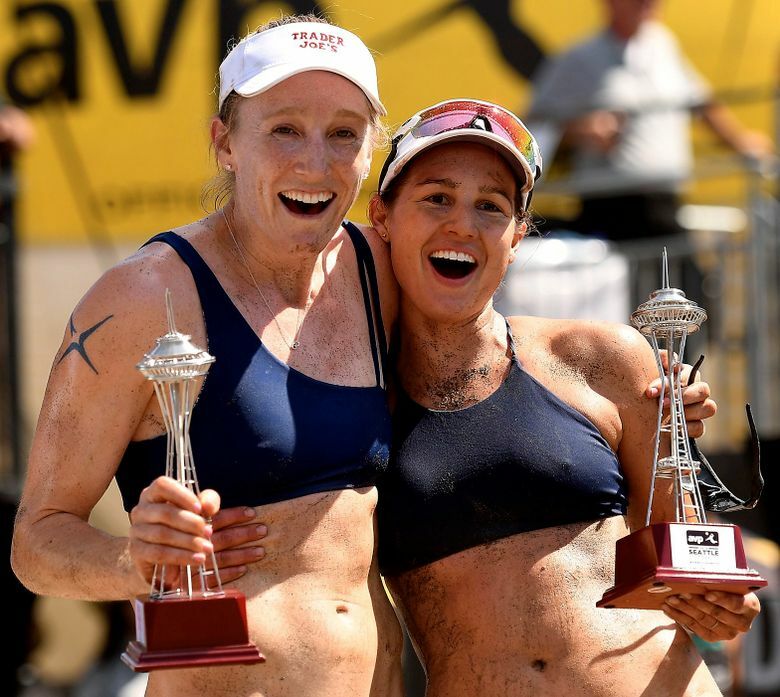 In the women’s final of the AVP Beach Volleyball Seattle Open, second-seeded Betsi Flint and Emily Day won the women’s title over third-ranked April Ross (Costa Mesa, Calif.) and Caitlin Ledoux (Phelan, Calif.) in three sets. The pair recovered after losing the first set 21-19, then won the final two frames 21-19 and 18-16. The women’s final was tense and exciting as the teams traded points with a championship on the line. In the third set, both teams attempted match point four separate times before Flint and Day came out on top. It was the second time in the tournament that Flint and Day beat Ross and Ledoux. Flint (Los Angeles) and Day (Torrance, Calif.), both graduates of Loyola Marymount, have each won multiple AVP tournaments, but this was their first as teammates. Flint finished the match with an impressive 17 kills. In the men’s finals, third-seeded Taylor Crabb and Jake Gibb beat top-ranked Phil Dalhausser and Nick Lucena 21-16, 21-19, avenging their loss in a rematch of the AVP New York City Open finals. Gibb (Bountiful, Utah), has now won 49 AVP tournaments, while Crabb (Honolulu) won his third. The victory kept Dalhausser and Lucena from winning a third straight AVP tournament. The day started off with Flint and Day advancing to the finals in straight sets, beating No. 8 Irene Pollock and Amanda Dowdy 21-16, 21-13. In the men’s semifinals, Crabb and Gibb swept Jeremy Casebeer and Reid Priddy 25-23, 21-15 to move on to the finals.